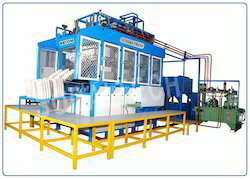 We are offering you a complete choice of products which include Pulp Moulding Machinery such as Multi Side Rotary Pulp Moulding Machinery, Dry Molding Machinery, Reciprocating Moulding Machinery, Rotary Pulp Moulding Plant with Online Drier, Pulp Preparation System, Paper Recycling Machine and many more items. We have gained the specialization in offering a wide array of Reciprocating Pulp Moulding Machine. The offered product is assembled using the best quality components and innovative technology. Offered machine is available with us in different stipulations to meet the diverse demands of the customers. We manufacture pulp moulded egg tray machining for the different type of egg trays and egg boxes. In addition to this, we assure to our valued clients to provide a quality tested Reciprocating Moulding Machinery that can be delivered from our end at a leading market price. Manufacturers and exporters of pulp moulding machinery to produce egg trays, fruit trays, seed pots, hospital disposables. The fully-automatic paper pulp moulding machines rotary type meet large-scale production of egg trays & fruit trays while the reciprocating type egg tray plant suits well to individual poultry farms. To meet the increasing needs of environmental biodegradable packaging for various industrial applications, we have innovated our pulp molding machinery to make all sorts of molded pulp packaging paper trays for electronic appliances like mobile, telephone, audio, video, shoe inserts, hospital disposable medical trays like bedpan, kidney tray, male urine bottle and other environmental biodegradable packaging. With the help of diligent experts, we are able to bring forth a wide assortment of Dry Moulding Machine. These dry moulding types of machinery are manufactured under the supervision of the best industry expert as per set standards. Before final delivery, a team of quality examiners stringently check these items on varied parameters of quality, to ensure that offered dry moulding machinery is free from defect. In addition, clients can avail these dry moulding machinery from us in varied specifications in accordance with their needs. This machine is used to add smooth finish and presentation to the trays. 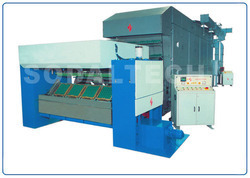 The machine is simple to operate and maintain and the output is synchronised with main moulding machine. 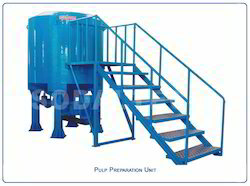 This machine is used to make liquid pulp from waste paper.The machine is ruggedly built to withstand fluctuating heavy pulping loads and the walls are made of mild steel with rust preventive coatings. The special material used in cutter (Impeller) ensures aggressive cutting action with less input of power and time. The cutter is operated by an electric motor. Optional Automatic waster paper conveyor can be attached to pulper. We are one of the trusted names to offer Rotary Pulp Moulding Plant with Online Drier for our valued customers. Our offered range of moulding plant is made from the high-grade quality raw material. Offered moulding plants are widely used in various industries. These moulding plants are easy to use. 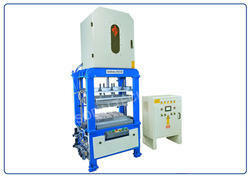 The Rotary Model Moulding Machine is of state-of-the-art design and is operated by electro-pneumatic power. The advanced design of control has independent control circuits for all operating units and conveniently located remote control operation ensures the operator to work comfortably and to have close monitoring of the process. Most of the sensitive operations are logically controlled and fail-safe. Packaging Details: as per international practices. The On-Line Drier is used to dry the products and delivers out the same through the conveyor. 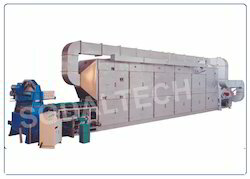 The On-Line Drier is of tunnel type having independent metal trays coated with heat resistant coating and holders operated by automatic indexable conveyorised chain. The conveyor is of multi-pass system to save energy, space and investment. The whole chamber is made in a strong fabricated structure and the walls are insulated to have minimum radiation loss. Both sides of the Drier can be opened easily for general maintenance and inspection. The inner walls and ducts are protected with heat resistant paint for long life. A safety clutch is provided to prevent any major accident while in operation. 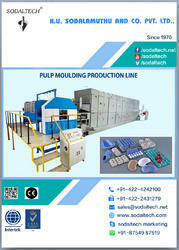 Looking for Pulp Moulding Machinery ?